The Antenna can broadcast its range, and display name from its location. However, they may also broadcast the location of specific systems on the same ship/station as the antenna if enabled to do so. The antenna can also relay the signal of other antennas within its range. Much like the Beacon, the antenna is capable of broadcasting its location. 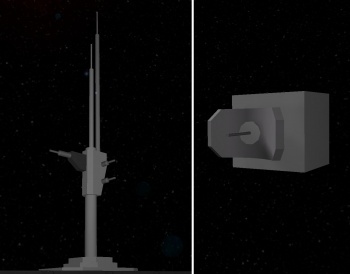 The power demand on the large ships and stations for the antenna is 200x higher compared to the beacon. However, the antenna has far more functions than the beacon, in return draining far more power. In addition to its broadcasting abilities, the antenna can also display specific systems on the grid it is attached to. This can only be accomplished if the object's "Show on HUD" control setting is set to Yes. Enabling "Show on HUD" on objects does not increase power usage. If a player was to enable this feature on 100 small thrusters, it would not draw any more power than it already was. Note that the range of the object being shown is also the same as the antenna's maximum range. So if the antenna is 5000 m, the object with "Show on HUD" enabled would also have a range of 5000 m. Currently as of patch 01.045, there is no way to alter this. The antenna may also show a ships name, along with the antenna's own displayed name beside it. - Remote Access to blocks: This allows manipulating all the block settings/parameters of an object and to execute available actions of each block. This is done via the K-menu and doesn't require a remote control block. Example: viewing through a camera, reversing rotors and pistons, etc. - Remote Control of an object: To enable remote control of an object an antenna is necessary in addition to the remote control block. The remote control block itself is activated via remote access in the K-menu. See Remote Control block for further explanation. The range of remote access and control is 200m (broadcast range of the cosmonauts suit) unless enhanced by relays (see below). Currently [1.064], blocks on an object cannot be accessed by another object via remote access (in case the objects are not connected). Only players can remote access blocks on an object e.g. when sitting in/on another object. The most notable feature of the antenna is its ability to also act as a relay for other antenna and/or beacons. 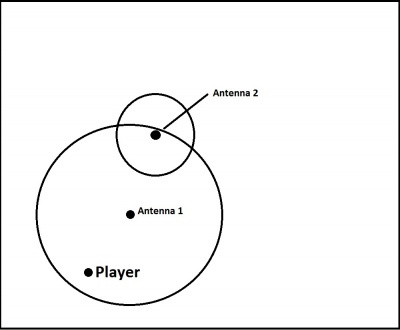 When a player enters a radius of an antenna, if there are any other beacons or antennas inside its radius, it is also displayed for the player. Even if a small ships broadcast for example isn't in range of the player, it may be transmitted through the nearby antenna to the player. The player may also interact/control the ships even beyond the ships broadcast range, but is still within range of a different antenna. In this example, Antenna 1 is broadcasting the Player's signal to Antenna 2. Antenna 1 cannot see Antenna 2, but Antenna 2 can see Antenna 1's broadcast and the player. 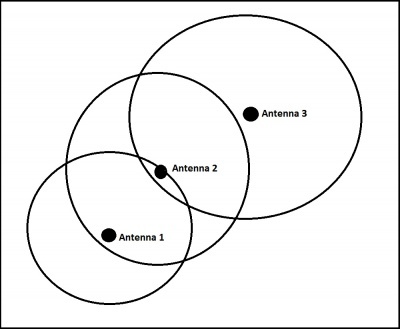 In this example, we have a network of 3 Antennas. Antenna 1 and 3 are out of range of each other. However, with Antenna between them within its radius, Antenna 1 can see Antenna 3, and 3 cannot see 1. 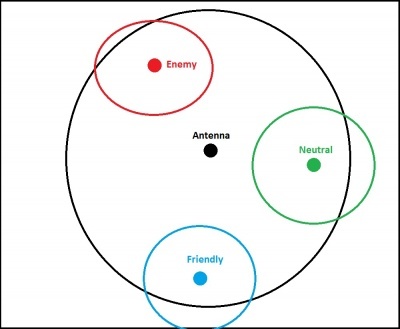 This shows the color codes of factions with different relations with the player all can see the antenna none can see eachother. This page was last modified on 30 October 2018, at 11:26.